Roulette is a casino game which has a long history. It is considered to be the oldest casino game. The roulette casino game has French roots and the name "roulette" (from French) means "little wheel". Blaise Pascal is a French mathematician and physicist who is known as the creator of the first form of roulette wheel. It was created in the 17th century. Brothers Francois and Louis Blanc are also well-known by their contribution into the history of roulette wheels and roulette casino game. 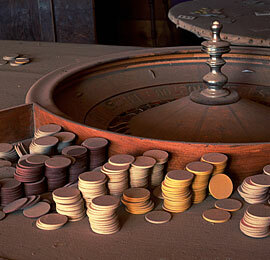 In 1842 they built a single zero roulette wheel. The Frenchmen understood that adding zero prevents the casinos from loss providing them by a house edge. The brothers invented such wheel for King Charles III. Charles III was a King of Monaco. He wanted to improve the financial things of his kingdom and decided to build a casino. The new created casino became the important source of revenue. Ron Shelly is a person who changed the view of roulette in North America. It had happened in 1985. In the casinos of Las Vegas and Atlantic Shelly introduced the Huxley low profile wheel. Huxley is one of the roulette wheels manufacturers. Before 1985 there was only one wheel of this type in the USA and only in two years such wheels spread in all the states. In 1993 Shelly placed in operation the Cammegh-TCS wheel. Together with the Cammegh-TCS wheel he introduced the display showing the winning numbers. It was a well-loved innovation and now we can state that 100% of North American casinos possess such winning number displays. Cammegh contributed a lot into the development of roulette technologies. It was related mostly with roulette game security. So called "eyeball" camera was one of the innovations. This camera was created to follow the ball and the wheel with the help of special computer readouts. The "eyeball" could be fixed in the balltrack or near the winning number display above the wheel. Another nice device such as an automatic ball release was worked up. It could change the speed of the ball and make impossible for the roulette gamblers to predict the pocket where the ball will drop in. Cammegh named this device a "slingshot". Nowadays a huge percent of gamblers prefere to play online. One of the newest and popular games is 3D version of roulette. It is quite catching to the eye. To start the game one should first read the 3D Roulette Rules, because they can differ a bit from those for the original game. Modern wheels are constructed in the way that it is almost impossible to win a lot of money. The most famous manufacturers in our days are Cammegh and Huxley. So, the history of roulette wheels is interesting and the progress never stops and new devices are always developed to make the roulette casino game more exciting for the gamblers and more secure for the casinos. Together with the development of roulette technologies the roulette myths covered this popular casino game of chance.